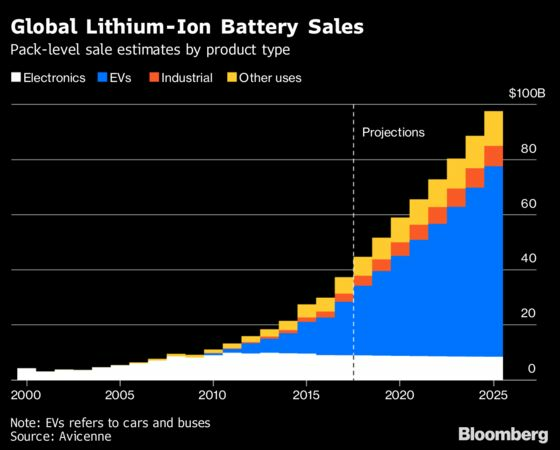 (Bloomberg) -- Chinese battery maker Contemporary Amperex Technology Ltd.’s opening of a factory in Germany may mean a faster roll out of electric vehicles on the nation’s roads. CATL and the state of Thueringia in central Germany Monday announced a plan to build a 16-gigawatt lithium-ion plant close to the region’s capital Erfurt. The Chinese company will invest 240 million euros ($282 million) to build the 173 acre site by 2022 and create about 600 jobs, the state said. CATL’s decision to choose Germany for its first battery factory outside China is a chance to bring electric mobility “faster to the roads,” said the Frankfurt-based VDMA machine makers federation. CATL picked Germany to be close to the production centers of BMW AG, Volkswagen AG and Daimler AG, the state said on its website. German carmakers and Chancellor Angela Merkel’s government expect rapid growth of the electric mobility market from the start of next decade as the country ramps up efforts to cut carbon pollution from transport. CATL’s move could shorten the time Europe takes to catch up with China and South Korea in making battery cells. A push by the EU Commission to create an “Airbus” of battery-cell production -- meaning participation from multiple trade bloc states -- has stalled, mainly on expectations that Asian rivals are better positioned to lower the costs of a commodity product like battery cells. BMW said today it will source some 4 billion euros worth of battery cells from CATL in two orders -- one from China and the other from the new plant in Germany. CATL’s experience of running a lithium-ion business in its home market combining with advanced German electrical and mechanical technology will spur further investment in battery cells in the region, said the VDMA.